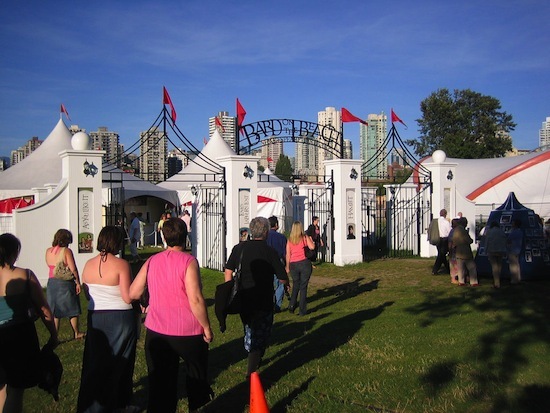 The annual Shakespeare festival returns to waterfront Vanier Park for its 24th season, June 12-Sept. 14. Its signature open-ended tents, perched on the edge of English Bay, allow theatregoers to gaze out at the sea, sun and mountains, as the bard’s masterpieces unfold on stage. Bard on the Beach started back in 1990, with one play, a hodgepodge collection of tents and a budget of $34,000. Since then, the festival has progressively expanded to become a Vancouver institution. It now features four plays, with a budget of $4 million, and attracts around 100,000 patrons to almost 200 performances every summer. The signature red-and-white tents have come a long way, too. The Mainstage Tent, a minor feat of engineering, accommodates 742 guests in stadium-style seating. In fact, it’s a little hard to believe it’s actually a tent. Meanwhile, the Studio Stage seats 240 people and showcases Shakespeare’s minor works and experimental productions. The two tents form the heart of Bard Village, a warren of cafes and shops under canvas that rises miraculously in Vanier Park every summer. This year Bard on the Beach has brought back two of Shakespeare’s best-loved works, as well as two lesser-known productions (including a non-Shakespeare play). On the Mainstage is the towering, ageless tragedy Hamlet. The Prince of Denmark, confronted with betrayal and murder, embarks on an insatiable, shocking quest for truth. The production is set in our own times – a reminder that power, privilege and corruption are timeless. Also featured on the Mainstage is the comedy Twelfth Night. The classic romp about love and mistaken identity is updated to the year 1913. Young Viola comes to a fine European spa seeking renewal and true love, but she encounters more than she bargained for. On the smaller Studio Stage is Measure for Measure, the dark comedy about hypocrisy, sexual repression and the true meaning of justice. The production is set in 1900s New Orleans, the birthplace of jazz, and offers a tribute to that era. Finally, the Studio Stage also features Timothy Findley’s Elizabeth Rex. The contemporary play, which premiered in 2000, has Queen Elizabeth I running into Shakespeare one night at a barn where his acting company is staying. The Queen, who has sentenced a former love to be executed for treason at dawn, requires distraction, and Shakespeare obliges. Bard on the Beach opens on June 12. Evening show tickets are $43 for adults, $25 for youth. Matinees range from $25-$30. Special events throughout the summer include Bard B Q & Fireworks, an outdoor dinner, Shakespeare performance and private seating for the Celebration of Light fireworks (July 27, July 31 and Aug. 3; $99).